Watch cast interviews from the original release of Star Wars, and you can see that the stars had no idea what kind of juggernaut they were about to unleash. Mark Hamill chats about his background in soap operas; Harrison Ford's relaxed and reflective; and the reporters just want to ask Carrie Fisher about Debbie Reynolds. 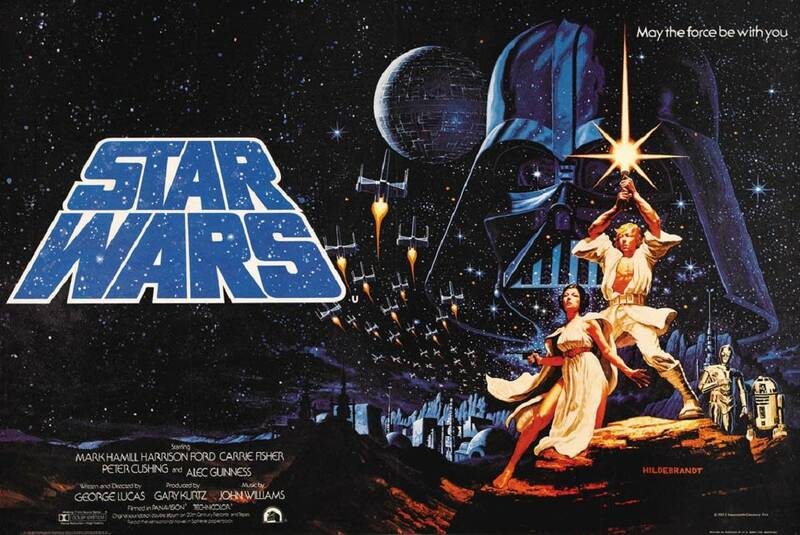 Star Wars was released 40 years ago today: May 25, 1977. When the lines started stretching around the block at Mann's Chinese Theatre, then at cinemas across the country, it quickly became clear that Star Wars was going to be a huge hit. By the time the original trilogy concluded six years later with Return of the Jedi, the series was a full-fledged phenomenon...but that was only the beginning. Here are just ten of the many ways in which Star Wars was a pop-culture game-changer. If Jaws (1975) showed Hollywood that a must-see summer film was a bar to reach for, Star Wars vaulted straight over that bar. To this day, studios fight for summer weekends to roll out their special-effects spectaculars, with Star Wars still the quintessential paradigm of ultimate popular success. Filmmakers started imitating Star Wars immediately upon its release, and they haven't stopped in four decades. Previous films had thrived on repeat viewing — Snow White and The Wizard of Oz, fantasy epics in their own right, come to mind — but Star Wars set the latter-day standard for a movie that never stops giving. The original film had four theatrical re-releases, and then the "Special Edition" hit theaters again in 1997. Countless TV airings and home-video releases followed, for everyone from casual fans who wanted a quick nostalgia hit on holidays to fans who scrutinized the movie so intensely, it inspired a podcast with a separate episode for every minute of running time. Star Wars became the definitive example of the "used universe" look. George Lucas realized that a fantasy world would be much more believable if it was as beat-up as the one we actually occupy, so Luke Skywalker's landspeeder, for example, looked like a rattletrap — which made the Empire's darkly pristine new Death Star all the more striking. The idea that a future world might actually feel lived-in influenced later landmarks like Alien (1979), Mad Max (1979), and Blade Runner (1982). There are so many famous visual elements in Star Wars, it amounts to a 121-minute museum of 20th century design. Darth Vader's sleek samurai helmet, the waspish TIE fighters, the two suns setting over the moisture farm: perhaps no other single film has such an ambitious yet wholly realized aesthetic. Even the stylized title is so perfectly rendered, you forget how silly the name must have sounded on paper. Today, John Williams is the most popular living composer of orchestral music, period. His filmography is much more than Star Wars, but his Star Wars score is the keystone of that achievement. The combination of Williams's music — Wagnerian in its scope, yet thrillingly lucid and accessible — with Lucas's fast-paced filmmaking is core to the Star Wars DNA. Williams has continued to develop his work, including recurring musical themes, in the sequels: the forthcoming Last Jedi will be his eighth Star Wars movie. The achievement is unparalleled. Star Wars figures. Star Wars drinking glasses. Star Wars books and costumes and bedsheets. There were merchandising juggernauts before Star Wars (Davy Crockett, king of the not-so-wild frontier) and after Star Wars (Dora the Explorer), but none have been quite so long-lasting and lucrative — with multi-generational appeal. The fact that Lucas later fell on his face with the overproduced Phantom Menace merch illustrated just how unique the appeal of the original movie was. Long before the internet, Star Wars was a viral sensation. The movie's marketing budget was dwarfed by the power of word-of-mouth; for a franchise so closely associated with a single creator, it's remarkable just how much personal investment Star Wars fans feel. One of the most interesting observations in Chris Taylor's superb book How Star Wars Conquered the Universe is that, ironically, the release of the controversial Special Editions and poorly-regarded prequels actually coincided with a massive surge in fan activity. Adversity only made the Star Wars army (which, thanks to the 501st Legion, looks and feels like an actual army) stronger. Star Wars is one of the great visionary works of art created by a group of people who believed that they could, and would, do what had never been done before. The team at what became known as Industrial Light and Magic invented anything they didn't have at hand to create worlds with a depth and realism that moviegoers had never seen before. From starfighter battles that moved with the speed of actual dogfights to a cantina full of eye-popping lowlifes, Star Wars showed filmmakers that they could do better — a lot better. The story of Star Wars is far from over, and the latest films in the saga aren't just basking in reflected glory. George Lucas himself — now strictly an emeritus creator since selling his intellectual property to Disney — grumbled that The Force Awakens was plot-wise a near-retread of the original Star Wars, but fans found it a completely refreshing new take on the story, with a diverse cast and high energy. The power of the Force continues to grow.